Last month Johnston Press journalists, enraged by a new publishing strategy and online/print content management system (CMS) called Atex, voted for group-wide industrial action. 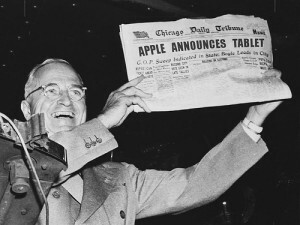 Atex will make reporters responsible for subbing and editing their own newspaper stories using pre-made templates. The vote was thwarted by a High Court challenge; a re-ballot is underway. Now several other companies including Archant are either using or considering using the same system. The NUJ has a point when they say that with fewer staff and less checks and balances, more errors will get through – this aberration of a front page in the JP-owned Bedfordshire Times & Citizen recently is a classic example. Yesterday I questioned exactly why the union was opposing Atex; included in the union’s greviances were baffling and unexplained “health and safety” concerns. The union later told Journalism.co.uk that they meant that it adds to staff stress levels. But, I went on in conversations both online and privately, isn’t this part of a wider problem? The NUJ has a fundamental belief that sub-editors should sub stories and reporters write them. Like the pre-Wapping ihousen-printers that jealously guarded their very specific, outdated roles, the ideal outcome for the union is to maintain the status quo and protect jobs. We’re still in transition in my newsroom at the moment – we haven’t switched to using it for the web yet. However, if the system goes ahead as planned we will not be able to insert in-line links into stories, nor will we be able to embed content from anywhere else online. It’s possible to build link boxes that sit next to web stories, but it’s time consuming compared to in-line links – and if our current CMS is anything to go by, in the press of a busy newsroom, it won’t get done. That sounds like a retrograde step. Far from holding back innovation, it sounds like JP journalists are right to oppose the move. This is from a company whose former chairman of nine years, Roger Parry, last week criticised the very board that he chaired for not investing enough in digital media (via Press Gazette). Exactly who else is there to blame? For those of us who possess data skills and want to make mashups, visualisations and so on, this is a massive inhibition – even if we find the time to innovate or create something really special for our papers, we’ll have no outlet for it. It also means we can’t source video or images for our stories in innovative ways – no YouTube embeds or Flickr slideshows – cutting us off from huge resources that could save time, energy and money while enhancing our web offering. It’s astonishing that we’re even considering such a backwards step to a presumably costly proprietory system when so many cheaper, more flexible, open source solutions exist for the web. Regional reporters, web editors and even overall editors will read that and find this frustration of digital ideas by technical, budgetary limitations very familiar. The last point rings loudest of all: cheap, dynamic blogging solutions like WordPress and Typepad provide all newsrooms need to create a respectable news site. Publishing executives seem to find it hard to believe that something free to use can be any good, but just look at what’s coming in the in-beta WordPress 3.0 (via @CasJam on Mashable). So the union’s misgivings in this case appear to be well placed. The drop in quality from Johnston’s cost-cutting is there for all to see in horrendous subbing errors, thinner editions and entire towns going without proper coverage. Unfortunately, journalists have to accept that no amount of striking is going to bring back the staff that have gone and that times have changed. Carolyn McCall’s parting shot as CEO of Guardian Media Group was to repeat her prediction (via FT.com) that advertising revenues will never return to pre-recession levels – and don’t forget Claire Enders’ laugh-a-minute performance at the House of Commons media select committee, in which she predicted the death of half the country’s 1,300 local and regional titles in the next five years. Regional publishers may not all have a solution that combines online editorial innovation with a digital business model right now. But to get to that point, reporters will have to cooperate and accept that their roles have changed forever – “sub-editor” may be a term journalists joining the industry in five years will never hear. This entry was posted in Journalism, Newspapers, Online Journalism and tagged Atex, Bedfordshire Times & Citizen, cms, content management system, Johnston Press, jp, National Union of Journalists, nuj, Patrick Smith, strike action, strikes on June 16, 2010 by Patrick Smith. MPs, Westminster hacks and activists might be addicted to expressing themselves in 140 characters or less, but don’t expect this year’s general election to be decided on which party has the best social media strategy. Then again, politicians and the media shouldn’t dismiss voters’ digital engagement, according to a panel at a Frontline Club debate on the importance on social media for the upcoming election. Twitter certainly has the potential to land politicians in mini-media storms; the panellists agreed: if David Wright MP had merely told a reporter verbally that Conservatives are “scum” it’s unlikely to have got much coverage, such is the continued novelty of Twitter to many news editors. Channel 4 News presenter Krishnan Guru-Murthy said social media buzz doesn’t determine what C4 leads its 7pm bulletin with – but Twitter got the network’s reporters in touch with someone in the audience at Nick Griffin’s notorious Question Time performance. If you ask any journalist what they think about a phenomenon like Twitter (…) they tend to think about what it means for journalists, but where its potential really lies is for audiences. Reflections with Richard Sambrook – a one-to-one conversation with the BBC’s outgoing director of global news. He’s headed for a new role as vice-president of PR firm Edelman, but how does he look back on a rich career and what is his view of journalism today? Iraq: The Media Inquiry – a special panel discussion to examine the media’s reporting of Iraq since the invasion in 2003. 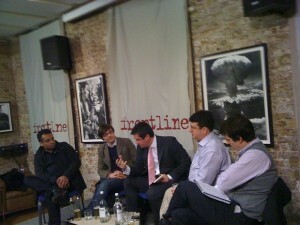 With Nick Davies, author of Flat Earth News; Patrick Cockburn, The Independent’s Middle East correspondent and journalist David Rose. Moderated by Paddy O’Connell, presenter of BBC Radio 4’s Broadcasting House. Insight with Timothy Garton Ash – the columnist and Oxford professor will be in conversation with Channel 4 News anchor Jon Snow will be in conversation with Channel 4 News presenter Jon Snow. Garton Ash will be talking about his career, the transformation of Europe over the last thirty years and what Barack Obama will mean for the United States and the world. On the Media: Is the age of celebrity-obsessed media coming to an end? We discuss whether the ubiquitous presence of pseudo-famous faces on newspapers and news bulletins is here to stay. With comedian and journalist Jane Bussman; Popbitch founder Camilla Wright; Heat magazine editor and broadcaster Sam Delaney. Chaired by Robin Morgan, former editor of the Sunday Times magazine. This event is in association with the BBC College of Journalism. This post also appears at the Frontline Club’s Forum blog. This entry was posted in Citizen journalism, Events, Journalism, Social media and blogging and tagged david wright mp, Frontline Club, general election, Patrick Smith, social media, Twitter on February 17, 2010 by Patrick Smith. Paul Mason, economics editor of BBC’s Newsnight and National Union of Journalist (NUJ) rep for the programme, gives some fairly frank thoughts to the union on journalism, its future and its relation to new technologies and forms of publishing in the video interview below. “What you have to do is to try and define what the skilled class of professional journalist actually does in that world. What makes us worth employing? We are the ones who provide accurate information: we’re not going to disappear,” he says, before asking how many bloggers can be described as authoritative. Discussing recent journalism job losses, Mason argues that this is not the result of just the recession, but has been caused by ‘deskilling and the rise of new technology’. Accuracy, authority and the peer review mechanism of the newsroom will safeguard journalism’s future, he adds. This entry was posted in Journalism, Online Journalism, Social media and blogging and tagged BBC, economics editor, journalist, Kevin Anderson, National Union, Newsnight, Newsnight and National Union, Patrick Smith, Paul Mason, professional journalist on January 5, 2009 by Laura Oliver.